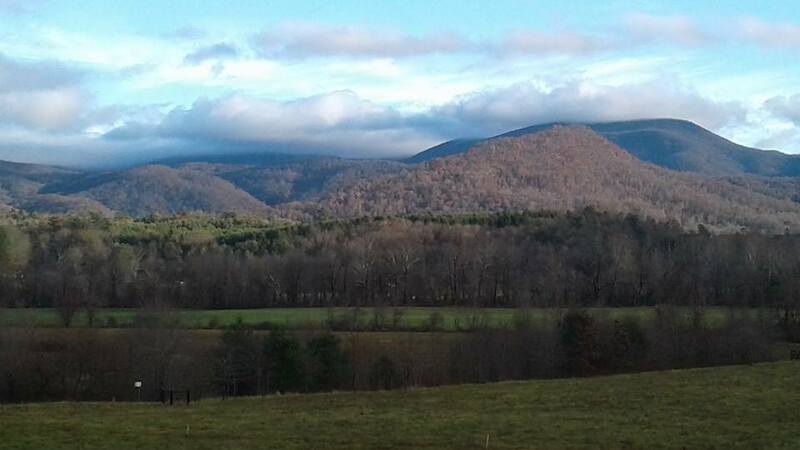 It feels like a beautiful fall day here in Dennevy, France. Except, of course, that it is the middle of summer. I am not complaining mind you. The sun is shining and there is fresh cool breeze in the air. I remain, after living in New Orleans for over ten years, a tropical climate body and I have to laugh at myself as I walk around in France in July wearing fleece and… I hesitantly admit.. a scarf. It feels good to be tucked up and warm. I took an outing away from the land of Les Battees last week. My first excursion on my own since arriving in France. It wasn’t totally on my own as I “hitched” a ride with my host and his girlfriend to Chalon sur Saone for the street theater festival, Chalon Dan La Rue. After months in the shelter of the mostly English speaking Les Battees and the company and companionship of Roy’s mum, Marina and Roy as well… I was, shall we say, hesitant to strike out in the land of French on my own. I was like a little baby bird being kicked out of the next. It was time. The three of us arrived in Chalon and I was escorted to the tourists office. I was armed with a map, a bus schedule and a schedule of the events for the street theater. I looked at Roy with the eyes of an abandoned child and left to allow them some privacy for their date. I jokingly said in departure… “If I never see you again… it was nice knowing you…” Sometimes my nervousness strikes in me without my permission, and there it was as I left on my own for the day. The best cure for that? Practice. So I set out to enjoy my day in Chalon. Listening to Roy’s advice I headed towards the center of town and followed the people. It was a coolish rainy day as I wandered around a bit seeking the best direction. I saw a few colorful characters that reminded me of my days and times living in New Orleans. And then, while walking around in the center of the city square it seemed that someone was following me… It was a woman… and when I moved to the left… she moved to the left. When I moved to the right… she moved to the right. Yes, she is following me, I thought with my suspicions protective lens. So I decided to test her and made a sudden u-turn in the square only to greet her friendly french face and discover… that she was… part of the festival…a mime of sorts. And she was following me. She handed me a harmless red foam square and did her best to explain her project to me in her modest English. It seemed they were handing out the red squares to people and inviting them to leave them in a public space… anywhere… and take a picture of it and then send the picture and why they placed it there to their website. Harmless. Following my nose and the crowds led me to a small stage just outside of the center of town. A band was setting up so I settled in, ate a little lunch and waited for them to perform. They were a “young” group, likely in their early twenties, all dressed up in funky band uniforms. They called themselves the Pullup Orchestra and when they started playing my mind, my body and my spirit were met with some relief. Their funky sounds and playful performance put some of my nervousness at rest. They were from Switzerland and surprisingly fun. They had a brass band sound but also added kind of a hip-hop feel. Here is a little sample of what I heard! Using what I now see are basically remnants of French from my studies in High School, I was able to handle the basics in French in my day. I got directions to the bank. I bought myself some food and I found a bathroom! 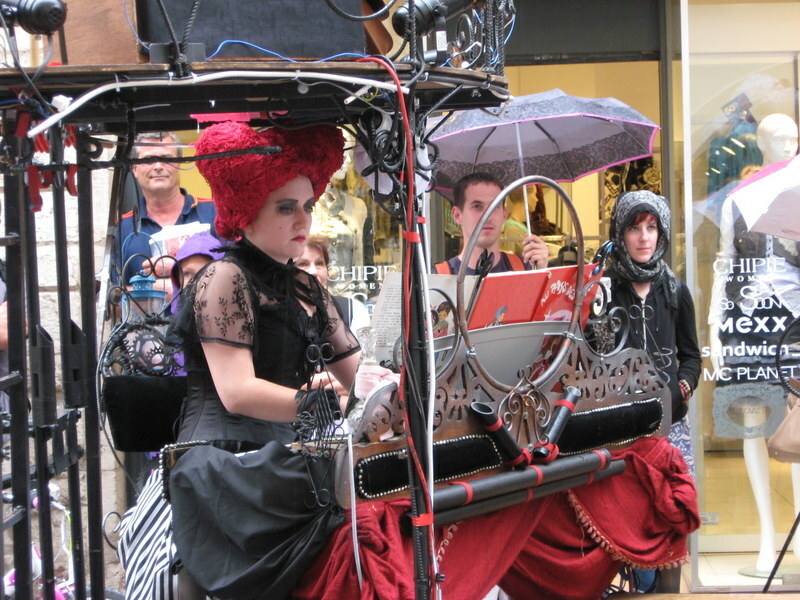 Walking through the streets, I stumbled to the next “act” driving down the road on a coach of sorts pedaled by one of the lovely performers. It was three women dressed in costume, the woman at the lead was singing opera with a beautiful comical air. It was in French so I did not understand what they were saying, but watching I was entertained just the same. They brought their carriage to a halt and engaged in an amusing display. The lead was singing and taunting, with their “cyclist” dismounting the carriage to apparently select men for the lead actress. It was a quite a routine, the men being sprayed with what I can only assume was some sort of “love potion” by the woman fetching men while the men were serenaded and seduced by the lead on the carriage. When their business was done, they saddled back up and peddled away to their new destination and I went to look for mine. I had a schedule for the day which was in French, but I was able to fend my way through it. I caught a show on the other side of town that just blew me away! The group was called Urbaphonix. 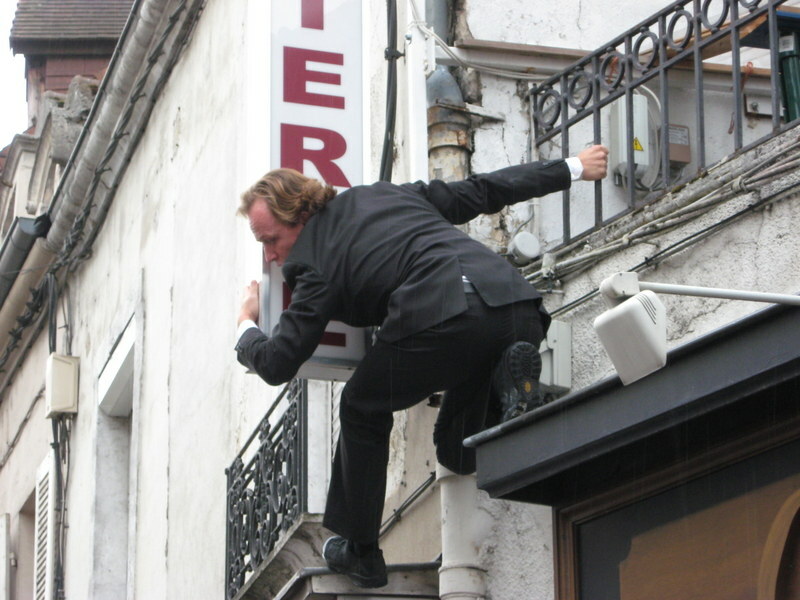 It was such great street theater, a collection of youngish men arriving in suits with some urgency, exploring the landscape around them until finding a perfect spot. They attached some sort of electrical device to that and other spots… and began to play. Balconies, bicycles and street signs were transformed into music instruments. It was so “smart” and their performance so engaging, it was really a fresh experience. Here is a little sample. I stumbled upon a few more acts for the day, all of which were really excellent in a way that impressed me, and then began to make my way to the bus station. Relying on my map to point me in the right direction, I easily found the station and my bus back to Les Battees. One Euro fifty cents later, I was on the bus and on my way. I arrived back at Les Battees with the house to myself for a little bit, enjoyed a dinner of leftovers and a movie accompanied by the companionship of Picsou the dog and the day was complete. For today it looks like a fresh easy day at Les Battees. We have guests upstairs at the Chambres d’Hotes staying for a few days, which means we can rest a bit. I am hanging out in my room newly accompanied by my venus flytrap plant… an offering from Roy to aid in reducing the number of flies wandering around my room. It is a good day for just chilling out and listening to the roar of the fall-like summer wind. 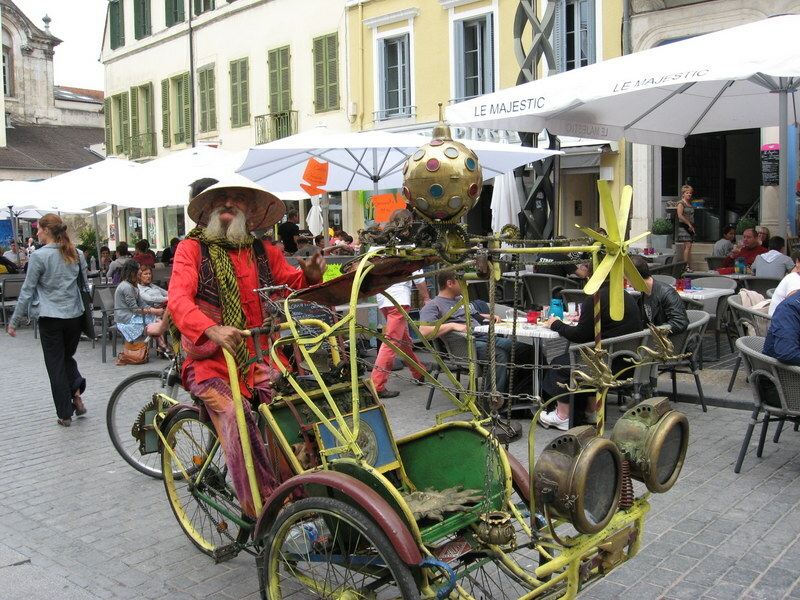 Photo of the traveling serenading carriage at Chalon Dans La Rue.